Check through some frequently asked questions. How does your online shop work? Online you can buy our fresh quality products the same way you would if you stepped inside our shop. Our butchers and service staff are working everyday to pack our coolroom full of tasty, fresh meat options. We want you to have access to all those options in the same way, online. Our Home Page and Shop Page contain links to all categories of meat and other items for sale. You can also access all categories from the main menu at the top of the screen. The Shop Page also has information on featured products and specials. We have 10 regular categories of products, plus collections such as Summer BBQ Favourites and a Shop All category. Shop all will display all products available for sale, in various order on the page. Click on the product you would like more information on, or would like to add to cart, for example T-Bone Steak. You will notice all our products are displayed per kg price, and an estimated total price – please refer to our pricing FAQ below for an explanation. Add T-Bone Steak to cart, by clicking the Add to Cart Button. You can view your cart by clicking on the shop cart icon at the top right hand side of your screen, or mobile. Once you have added all your items to cart, on the “View Cart” page, you can review your order. Enter your address details to show your delivery options. If you enter a postcode of an area that we deliver to, and your order is over the $100 minimum, then you will notice that delivery is now displayed as an option to add to your total, alongside click and collect. Choose either delivery or click and collect, then click “update your cart” and proceed to place your order. On the checkout page, enter your billing and shipping information. You can also choose to have your order delivered to a different address, such as a workplace, if you won’t be home to collect the order. Please refer to our delivery FAQ below for more information on areas that we deliver to. How does your online pricing work? You will note that all of our products prices are displayed per kg, so you can easily compare prices across our product lines. All of our per kg prices are exactly the same as our competitive retail prices in our shop. When and how do I make payment for my order? All of our product prices are listed as approximate as the final product we provide to you has not yet been weighed. We will endeavor to provide you with the closest possible weight to what is listed on the website, however the final price you pay may fluctuate, up or down depending on the final weight of the product. Click and Collect – our preference is for you to make payment from the pay now link / button on the email invoice before you collect your order. This means you can jump the queue and we can get your order straight out to you. If there is an issue with making payment this way, then payment will need to be made at the registers on collection. Delivery – payment will need to be made via a pay now link / button on the invoice you receive. You can make payment via our online payment gateway, which accepts all major credit cards. If your order has not been paid for by the time the scheduled delivery is due to be made, we will get in touch via phone to ensure payment can be made. Can I change my order once I have submitted it? The best way to make changes to an order once it is submitted is to get in touch with us via email info@gcfmc.com, or phone 07 5593 6333. We can endeavor to accommodate changes prior to your order being weighed and invoiced, however after this time, an order cancellation fee may apply. Do you offer delivery to my area? Take a look below at the areas we deliver to for orders over $100 minimum. Postcode / Suburb not listed here? Please give us a call on 07 5593 6333 and we may be able to accommodate special requests. What days / times do you deliver? Click and Collect is available during our shop opening hours (including Saturday), but we ask for 24 hour notice prior to an order being collected so that we have time to prepare it for you. I have placed an order for delivery, when is the earliest I can get it delivered? We want to make sure that you are receiving the freshest meat possible, at our great prices. 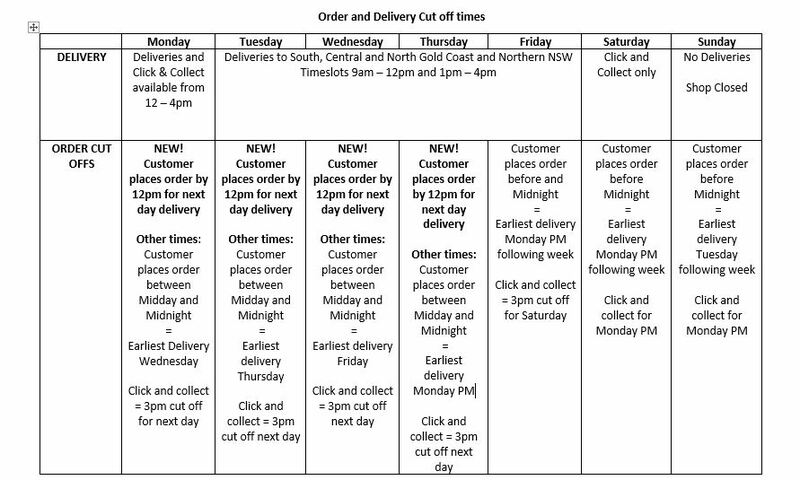 We have implemented the following cut-off times for our online orders and deliveries to ensure that we have time to process your order, weigh it at the correct price and send you payment information prior to the order being delivered. The good news is we are now offering next day delivery! If you place an order by 12pm, we can get it delivered to you the following day (on our delivery days). We charge $10 per order for all of our delivery areas. Only orders over $100 will qualify for delivery. Click and Collect is free of charge. How is my order packaged and delivered? Once your order is prepared, it is packed in a red tub inside a thick plastic liner, which is sealed and then transported in a refrigerated vehicle which is registered with Food Safe Queensland. This delivery packaging is not designed to be left however, following delivery, your order should be transferred to a refrigerator or freezer as soon as possible. For Click and Collect Customers – remember to bring your own shopping bags. I won't be home when my delivery is scheduled, what do I do? It is our policy that someone must be available to collect the delivery from the nominated delivery address. We will not leave fresh meat unattended at your home or workplace. We also strongly recommend that meat is transferred to a fridge or freezer as soon as the delivery has been made. At this point, GCFMC does not take responsibility for the safekeeping of the goods, once they have passed into your possession. If you won’t be home at your scheduled delivery time, you will need to get in contact with us via phone 07 5593 6333 immediately so we may be able to make alternative arrangements. However please note if alternative arrangements can’t be reached, then you may be liable for an order cancellation fee. If there is something wrong with your order, please refer to our refunds, returns and cancellation FAQ. We take pride in being a trusted name for quality meat and do our utmost best everyday to deliver on customer expectations of our products. If however for some reason you find that our service to you or our product has not met your expectations then the best thing to do is to get in contact immediately. Please call or email our Manager at info@gcfmc.com or 07 5593 6333. From there we can asses the situation on a case by case basis and provide the best form of action. Due to Health Regulations (sect 100) and the possibility of food tampering, we regret that we cannot refund or exchange unwanted purchases that have been taken from the shop or passed into your possession following delivery. Do you offer specials online? All of our online prices are the same as our competitive retail prices in our shop, however any day to day spot specials aren’t able to be transferred to our product lines in our online store (due to our business order processing procedures and cut off times). You will note a red special sticker on any products that we offer specials on online.